Last night my wife and I had the privilege to attend the 15th Annual Los Angeles Public Library Awards Dinner at the Hyatt Regency Century Plaza. 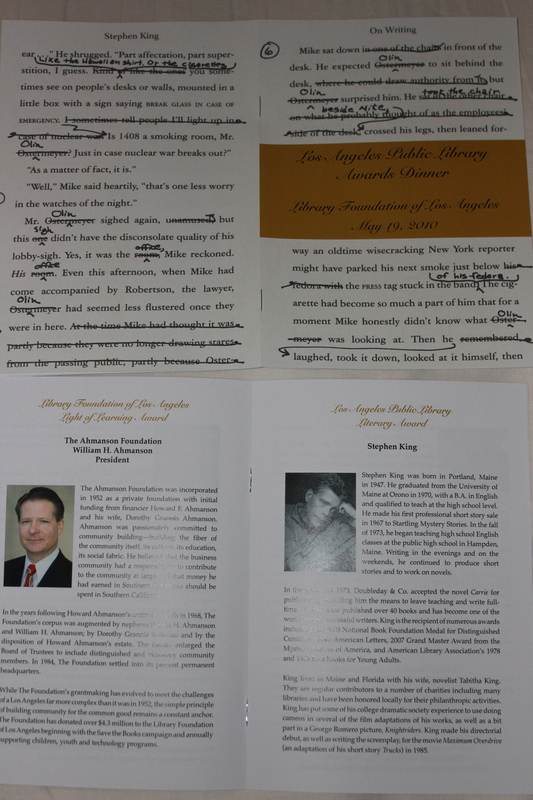 The goal of the Dinner is to augment critical funding and proceeds from the event assist the Los Angeles Public Library in providing literacy programs, books, materials, activities and public access to the latest electronic information resources. 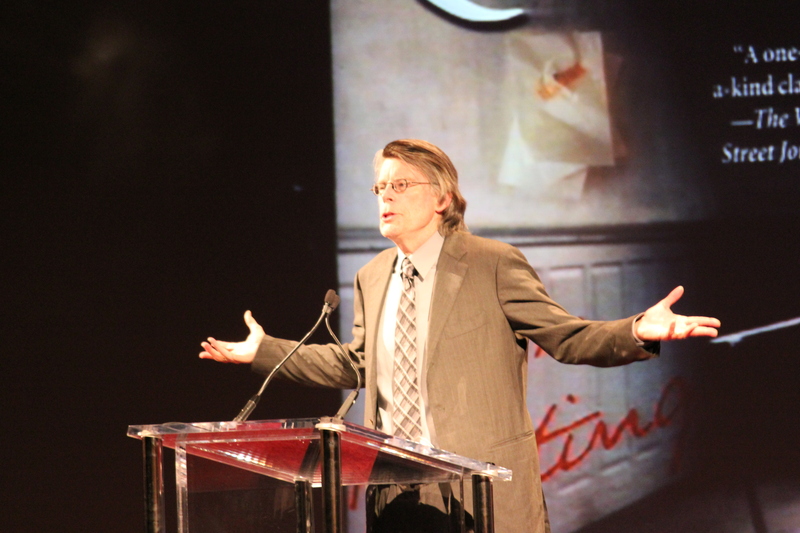 Stephen King was presented the prestigious Literary Award for his tremendous contribution to literature. We had an opportunity to meet with the author prior to the event, enjoy dinner with colleagues and then listen to King speak about his personal experiences with libraries. At the cocktail party we had a small window to meet with my favorite author. I asked him about his future books; the Dark Tower sequel and Dr. Sleep (The Shining sequel) and whether they would come to fruition. King smiled coyly (but did not respond) and his agent quickly said that he would like to see them both happen. When I told King about my blog, THE FIRE WIRE, he joked that in Maine it would be pronounced, “THE FI-AH WI-AH”. 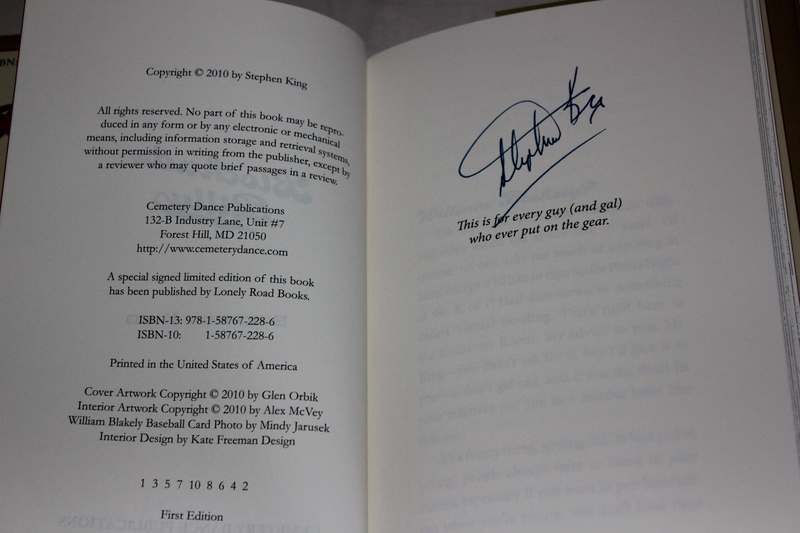 Stephen was kind enough to sign my copy of “Blockade Billy” and shared that this was the first copy that he has signed publicly. He was quickly whisked away for photo opportunities with the Los Angeles high society. The dinner was held in the hotel ballroom. The walls were covered with large graphics of book covers from past award recipients. Event pamphlets along with a copy of Stephen King’s “On Writing” were on the table for each guest. The paperback book had a sticker commemorating the event. 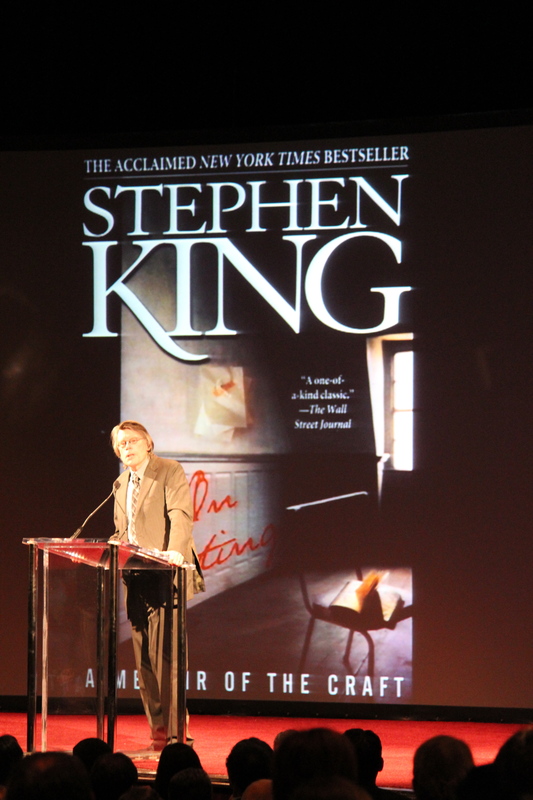 After dinner Mr. King was awarded The Literary Award and spoke for about 8 minutes. He was warm, gracious and very down to earth. The author joked that he had been in a suit only once before in the past 14 months and that if it hadn’t been a library event, he probably would have not made the trip as he does not like to travel. “Libraries are the reason I am here”, the famous novelist stated. He fondly remembered reading musty dog-eared detective book club trilogies, Ellery Queen, Raymond Chandler and Earl Stanley Gardner from the small library (if you call it that) from his rural Maine town. “These books opened a whole new world to me”. After reading the Frank Norris thriller, McTeague, King thought to himself, “I want to do this!”. It was a life changing experience for him. Stephen reflected on his 5th grade school and the fact that there were no library books available to him. One day a green bookmobile arrived and the future author was introduced to his first Ed McBain novel which led to him reading 30 more McBain books that summer. In later years, Stephen King met his future wife, Tabitha at the Fogler Library at the University of Maine – Orono where they both worked. His wife still teases that she “shelved books” while her husband could only cart books. “She still holds this over my head to this day”, Mr. King laughed. During their early stage of marriage, when finances were tight King’s wife cut up their credit cards but kept the library cards. “These things cost money”, Tabitha pronounced. “She was ahead of her time even then”, Stephen noted. The Kings read books to their children that they checked out from the local library as hardcover books were $5.95 at the time (the cost of a bag of groceries). The writer remembered longingly looking at the latest novels in the Bett’s bookshop window the way that people would look at food – “They (books) filled my mind”, he reflected. 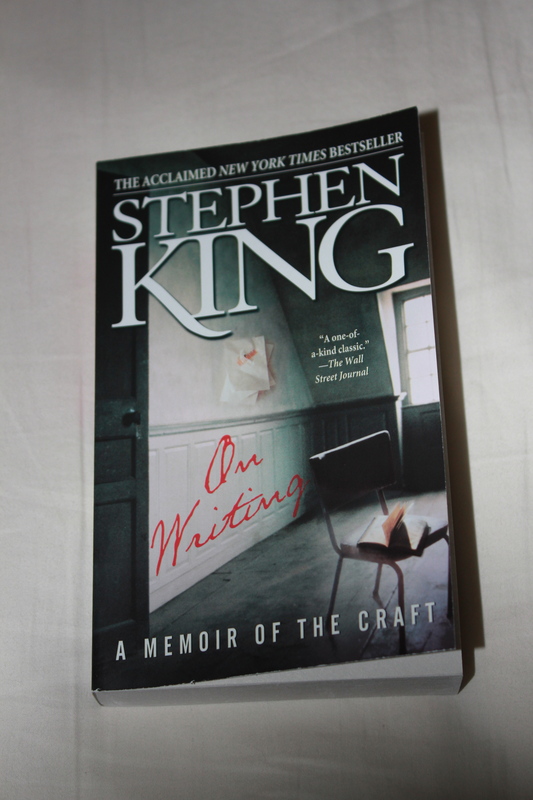 It wasn’t until Stephen King received his first advance from Carrie that he bought their first hardback book to build their home library. 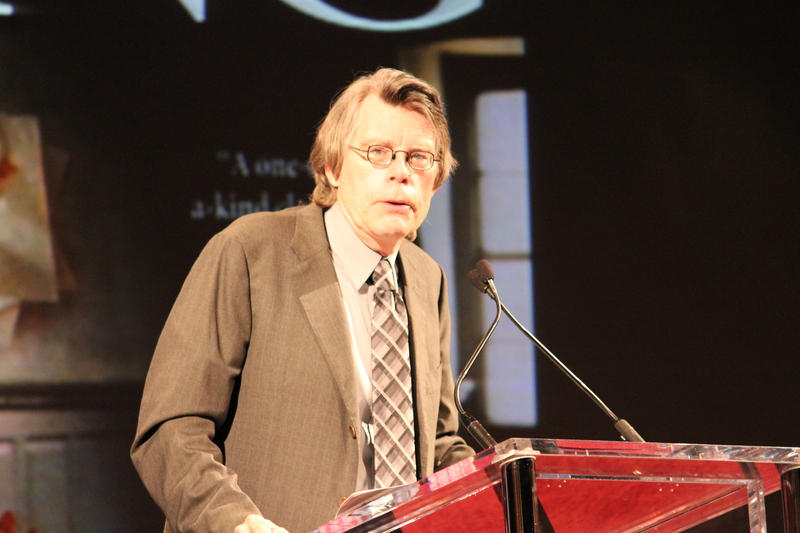 40 books later, King is one of the most famous and wealthiest authors on the planet. He is the Charles Dickens of our generation. 10% of his earnings largely go to assisting local libraries as they require upkeep, books and internet services. 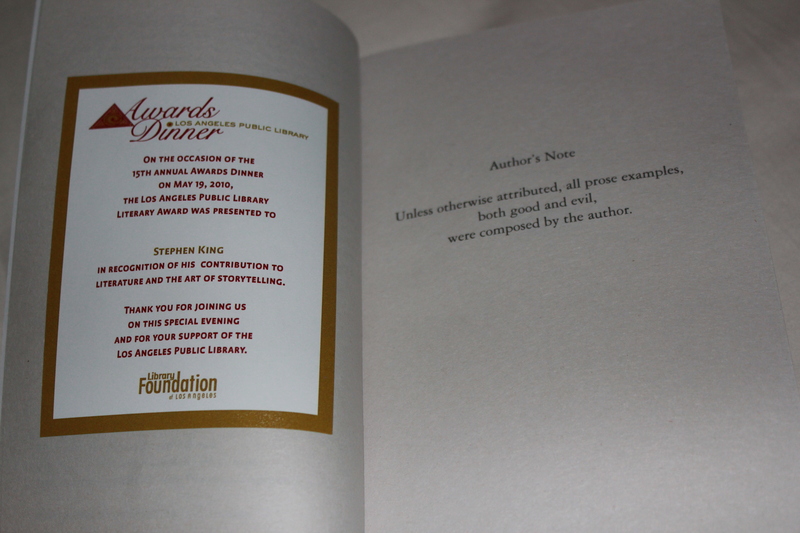 Along with the award Stephen King received a $10,000 honorarium. Finishing his speech, the magnanimous author held the check up and said, “If you want to know where this is going, I’m giving it back to the library…so it’s staying in the family”! Both my wife, Patricia and I were thrilled that we could attend the event. We met some marvelous people and had a wonderful time. We want to personally thank, Jennifer Essen, The Associate Director of Communications and Marketing for the Library Foundation of Los Angeles for the generous invitation and her time. 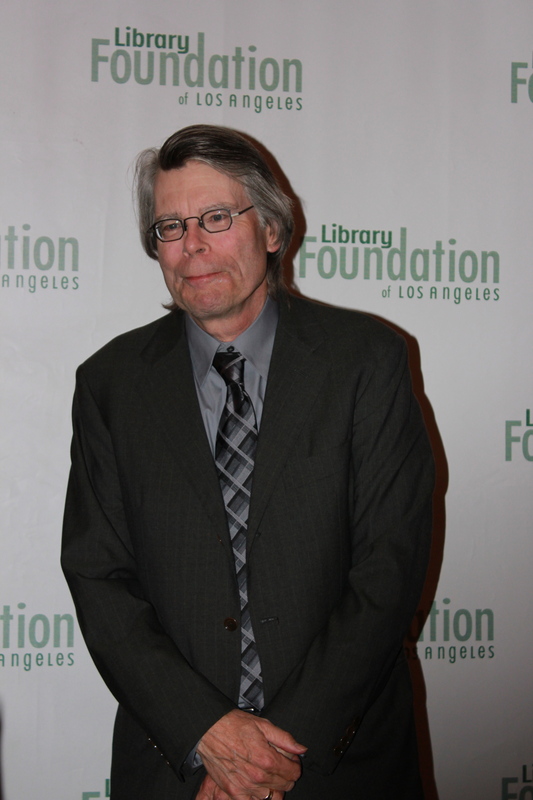 If you would like to support the Library Foundation of Los Angeles, you can find more information HERE. Please Become a Facebook Fan of THE FIRE WIRE by clicking HERE. Thanks so much for writing about the event and posting such great pictures! Glad you could come and enjoy seeing your favorite author. Hope you make the library your favorite cause! Thanks for sharing such a cool event. I admire King as well. Not just for his incredible imagination and work output (after all, he doesn’t HAVE to write another word, he’s GOT money) but for the fact that he contibutes so much to such a vital resource that is struggling to survive in all of our communities: The Library. It’ refreshing to see someone as accomplished as Mr. King take the time for such a worthy cause. Makes me like him even MORE, (which is practically impossible). Thanks for sharing the event with us that were not fortunate enough to attend. Love your site, keep up the good work. Thank you!! I love the details! The photos! The reporting! Most appreciated, for those of us who love SK and who would have loved to have been there. I’m thrilled for you and your wife, and thank you again for sharing it all with us. Larry, a great report. Thanks!